These New York-Style Cheesecake Bars are thick, creamy, and so easy! 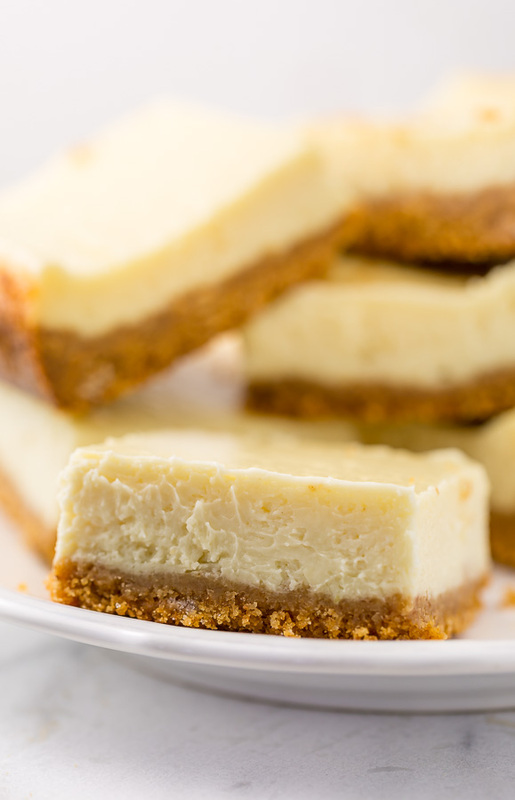 Perfect for almost any occasion, this easy cheesecake bar recipe is always a crowd-pleaser! With the month of July behind us, I can’t help but think one thing: Fall is right around the corner! It’s hard to believe considering it’s currently 8am and already 89 degrees. But it’s true! And between me and you… I’ve already started baking with apples. And sweet potatoes! And yes: pumpkin. I actually bought 16 jumbo cans of pumpkin puree from Costco last week and the cashier definitely gave me the side eye. But don’t worry, I’m not done with Summer just yet. I have a few more fruity recipes for you before we hold hands and head into the Fall baking frenzy together. I also have some brand new season neutral recipes for you, starting with today’s recipe for New York-Style Cheesecake Bars. Which can be topped with a fresh fruit topping for Summer parties… or topped with gooey pecans or roasted apples for a Fall effect. But between us bakers… my favorite way to serve – and eat – these little cheesecake bars is… naked. No fruit, no syrups, no caramels… not even a dollop of whipped cream! Just try one bite “plain” and you’ll know exactly what I mean. 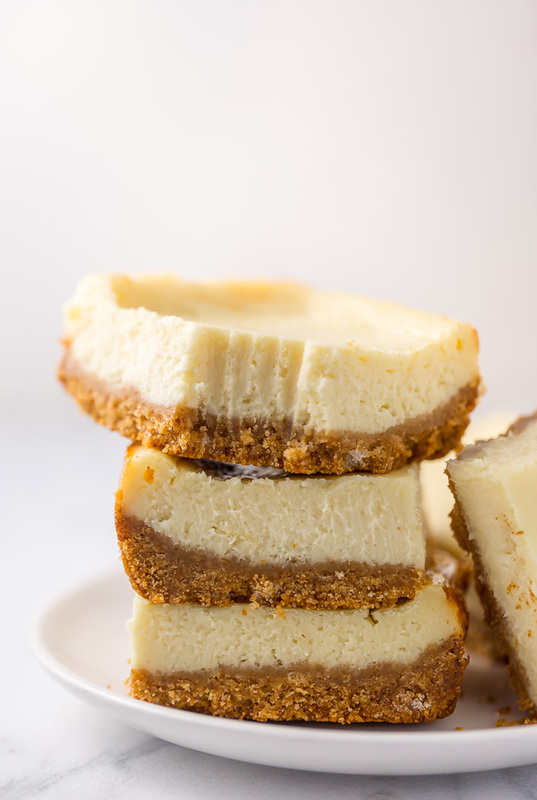 *There is nothing plain about these cheesecake bars! 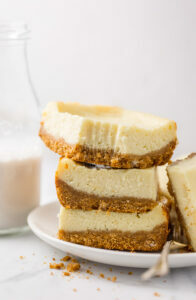 Ultimate New York Cheesecake Recipe in BAR FORM!!! I used my “internet famous” New-York Style Cheesecake as a starting point for these bars. Why? Because honestly, that recipe is so perfect that I didn’t want to change anything that didn’t need changing. If you’ve already baked it, you know what I mean! The crust is sweet, golden, and crunchy. And the filling is rich, creamy, and ADDICTING. So why make these bars? Well, I wanted to recreate the recipe in bar form for those of you who don’t own a springform pan… and don’t feel like buying more stuff. And I also wanted a cheesecake option for my baking pals who loathe the water bath process. Which I’ve learned from feedback is A LOT of you. So, without further ado, here is a creamy cheesecake option that requires no fancy pans or processes! Can I get a YAY and YUM?! So if you’re curious what I did change, I’m happy to share! I added a little lemon zest and juice, increased the vanilla, and decreased the flour to just 2 teaspoons. That’s it! 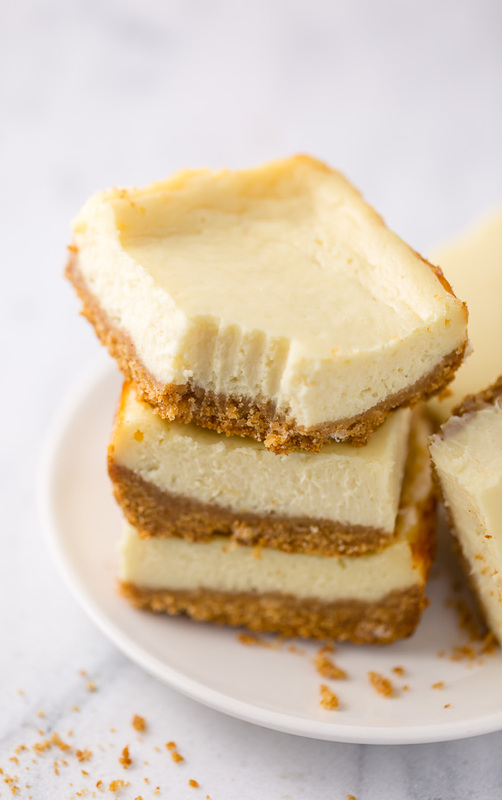 These changes were made to improve the taste and texture of the cheesecake in bar form, and even though they’re small, made a huge difference overall. Room temperature ingredients are crucial when it comes to making any cheesecake – including these bars! So be sure you bring your cream cheese, sour cream, eggs, yolks, and heavy cream to room temperature before you begin assembling the batter. To prevent the crust from sticking, you will need to line your 9×13-inch baking dish with heavy-duty aluminum foil. And be sure there’s an overhang of at least 2 inches on each side; this will help you remove the cheesecake bars from the pan later. And finally, you’ll need to spray the pan lightly with nonstick baking spray. To make the crust you will need melted butter, crushed graham cracker crumbs, and sugar. Yep – just three ingredients! You can buy graham cracker crumbs from the grocery store, or make your own by pulsing sheets of graham crackers in your blender or food processor. When pressing the crust down into the bottom of the pan, you’re going to want to press it down very firmly. A firmly packed crust will bake up nice and thick, and most importantly, won’t crumble much when sliced. I recommend starting to press the crumbs down in the center of the pan and then working the crust out and just a little bit up the edges. And last but certainly not least, do not over bake the bars. They should still be a little jiggly in the middle when you remove the pan from the oven. The will continue to cook as they cool. And since they need at least 6 hours to chill in the fridge, you’ll want to plan ahead time wise. 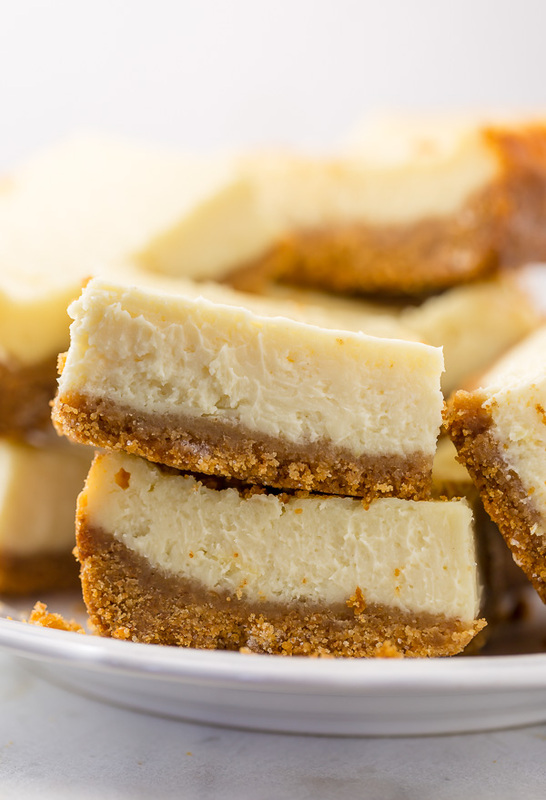 Rich, creamy, and dense, these are the ULTIMATE New-York Style Cheesecake Bars! Add sugar and vanilla and beat until smooth, scraping down the sides and bottom of bowl as needed. Add in the eggs and yolks and beat until combined. Add in the lemon juice and lemon zest and beat until combined. Stir in the flour, mixing just until combined. Check to ensure your oven has cooled to 325°F, then place the pan in the oven and bake for 38 to 40 minutes, or until the edges have set and the middle is still a little jiggly. The cheesecake will firm up a lot as they cool. When you're ready to serve: use the foil overhang to lift the cheesecake bars from the pan and transfer them to a cutting board. Using a large, sharp knife, slice the slab into squares, wiping the knife clean with a damp cloth between slices. Serve at once. 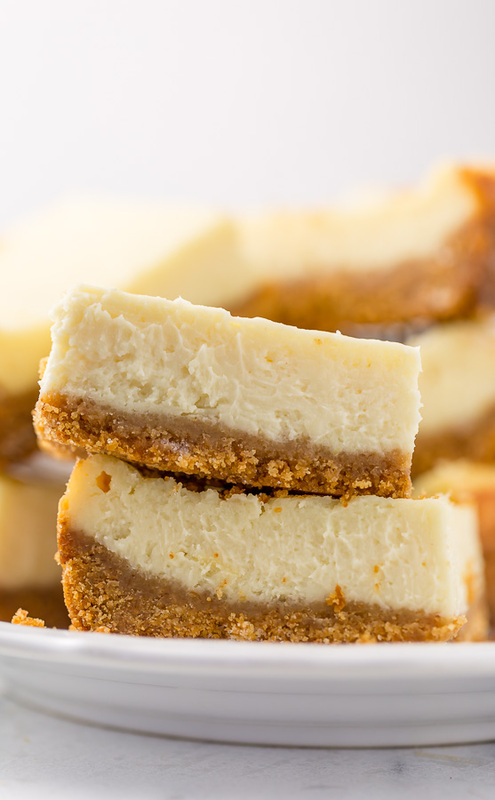 These New York-Style Cheesecake Bars will keep, stored in the refrigerator, for up to 4 days. You may also freeze them for up to 2 months. You mentioned spraying the pan. Is that under the heavy duty aluminum foil, or spray the foil? Thank you so much for this. These little babies are like blocks of joy from heaven to me. I always had a thing for New York cheesecake and your recipe just made me the happiest girl in town today. best of all it turned out better then I had expected when I tried your recipe. Made them this weekend for a bbq. They were absolutely amazing !!! Everyone loved them! I served them with a side a blueberries and lemon curd. Can I use parchment paper instead of the aluminum foil? Hey any substitute for sour cream . ? You could try full-fat Greek yogurt! To make this gluten free can they be made without the crust and use corn starch in place of flour? Hi Annie. I haven’t tried so I can’t say for sure. If using cornstarch, I would suggest cutting the amount called for in half. You can find a recipe for GF graham crackers and they are not hard to make. I have made them for my grandkids who are GF & DF and think they are better than store-bought! Also, if you have a GF substitute flour you bake with, such as King Arthur GF or Cup4cup you can do a straight 1:1 substitution. These cheesecake bars were amazing! They were the perfect ending to an amazing thanksgiving dinner! They took a little longer to cook, I would say 44 minutes to perfection! Made the NY cheesecake bars yesterday for Thanksgiving. I don’t think I’ll ever eat cheesecake another way but this way. I followed the direction to a “T” and they turned out perfectly which genuinely surprised me, as I’m not a baker by any stretch of the means. My 19 year old said “this is the best cheesecake he’s ever eaten” (trust me he’s had his fair share of cheesecake in his short life time . These bars were as creamy and delicious as described. I’ll definitely make these again. Thank you so much for sharing your recipe. Would it be possible to use this recipe for individual mini cheesecakes made in a muffin pan? Hi Ashley thank you so much for the recipe what can I substitute the heavy cream with? I made these today and they turned out delicious! Thank you!!! I made these for Christmas, and they were a big hit. I’m making more right now, and I will have to tease my brothers in law that they are too far away to share (they devoured them!). These are delish!! Thanks for sharing! If I omit the two extra egg yolks would it make any noticeable difference as I wouldn’t want it to have an eggy smell to it once cooled down. My go to cheesecake recipe… I’ve added a jar of lemon curd and lots of zest for a lemon cheesecake. All good. Thank you! Made these over the weekend – amazing! Decadent without being heavy. Highly recommend. The bars are good solo – I paired the bars with a berry reduction/topping and that was wonderful. I will make these again and again! I made these today and they baked up beautifully, but then developed a huge crack down the center after coming out of the oven…not sure why. Oh well, still delicious! Can these be made in a half sheet pan?